A new wristband for Sussex County Senior Citizens, available through Sussex County TRIAD. Photo courtesy of the Sussex County Sheriff's Office. Sheriff Michael F. Strada is happy to announce a new program being offered to senior citizens in our county. Upon request, Sussex County TRIAD will now provide silicone wristbands, black and gold in color, to every senior citizen of Sussex County free of charge. 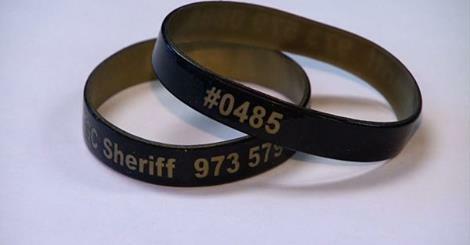 The bands are engraved with “SC Sheriff, 973-579-0888” and a registration number. That number will be used to register all participating senior citizens with the Sussex County Sheriff’s Office should the senior citizen be unable to communicate with emergency personnel. The TRIAD organization will obtain and keep secure the following information from the senior citizen; name, address, phone number, emergency contact persons and the senior’s physician information. This information will be available to assist any police, fire and EMS agency by calling the telephone number on the band and giving the dispatcher the registration number. This will assist any first responder in identifying a senior citizen in need who may be unable to communicate with the responder. Several businesses and individual donors have come forward to sponsor the cost of the program. The successful implementation of this program was made possible, in large part, thanks to the generous donations of the following Sussex County businesses. If you are interested in learning more about the TRIAD program or are interested in sponsoring the wristband program, please contact Hilary Manser at the Sussex County Sheriff’s Office at 973-579-0850 (Ext: 2114).